Within these pages you’ll find an ever-growing collection of yokai and yokai legends from all parts of Japan and all periods of Japanese history. Some of them have never appeared in English before, while others will be intimately familiar to fans of Japanese folklore. They have been collected from books, from the internet, and by word of mouth from yokai lovers who remember the tales from their childhoods. The illustrations accompanying each yokai are based on written descriptions or on Edo-period illustrations painted on scrolls hundreds of years ago. 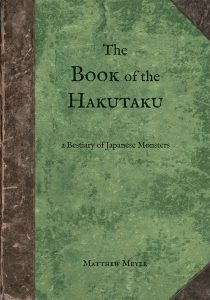 The Book of the Hakutaku, the third volume in my yokai encyclopedia series, will be available for order on Amazon very soon! Originally it was set to be released in 2018, but a manufacturing problem caused some delays with printing. The book is currently shipping to Kickstarter backers, and will be released to the rest of the world after the backers have all received their books. Are you trying to find a specific yokai but you can’t remember its name? 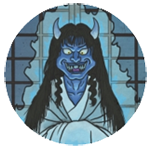 Visit the Yōkai Finder. While not exact, and not exhaustive, it can help you find yokai by various traits, categories, shapes, prefecture, etc., organized in post tags. It should make it much easier to search for the spirits you are looking for, and it’s another fun way to browse the site by category. Special thanks to my Patreon backers who made the Yokai Finder possible with their support! This website is kept alive by the support of my backers on Patreon. Through this project, new yokai are translated, painted, and posted up to yokai.com every month, free for everyone to read. Backers get regular yokai updates via email, as well as behind-the-scenes updates, and input on which yokai are selected for the website next. Patrons can also receive monthly postcards, yokai art prints, and original paintings. To become a yokai patron and support this site, sign up at patreon.com/osarusan.